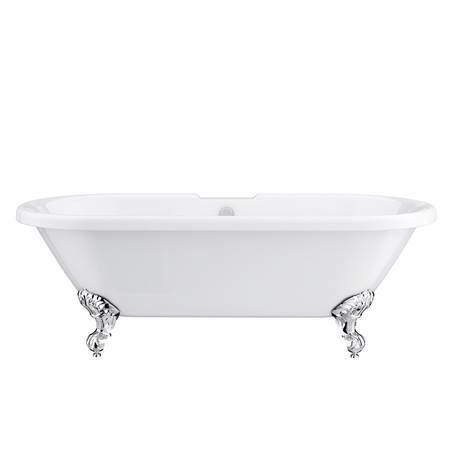 As part of the Victorian Elegance collection, this gorgeous Alison Cork double ended roll top bath comes complete with a stylish chrome leg set. Create a real focal point in your traditional bathroom with this luxurious freestanding bath and enjoy a hot relaxing bath whenever the mood takes you. Alison says, "There is nothing which says ‘Victorian’ quite like a claw foot bath. A true statement piece, it’s period detail commands attention and absolutely sets the tone of this elegant and dramatic bathroom." These freestanding baths are made from two 3.5mm sheets of acrylic with a fiberglass-resin filler layer which reinforces and insulates the bath.